The great actress Yamada Isuzu has passed away. She died on July 9 at the age of 95. It is important to remember not only her magnificent performances in such films as Kurosawa Akira's Throne of Blood or Mizoguchi Kenji's Sisters of the Gion, but also how much she lived the history of Japanese cinema. She debuted at the age of 12 in 1930, when Japanese cinema was still mostly silent. 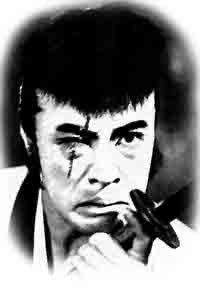 That film starred Okochi Denjiro, the actor whose face graces this site. At Yale we showed Itami Mansaku's masterwork, The Peerless Patriot (Kokushi muso, 1932) - which unfortunately only exists in an abridged version - and Yamada was already playing beautiful adult women at age 14 or 15. Her first two tour-de-force performances, in Mizoguchi's Sisters of the Gion and Osaka Elegy, were done when she was only 18 or 19. Her talent was tremendous. And she could do many roles. Few abroad have seen these, but her jidaigeki with Hasegawa Kazuo during the war at Toho, which combined mystery and comedy, are wonderful to watch. After the 1950s, she appeared progressively more on stage and television, but she still kept winning major awards. She was the first actress to be given the Order of Culture by the Japanese government (Sugimura Haruko was offered it first, but declined). Her personal life was not the happiest - born to a poor family; married four times; a daughter, the actress Saga Michiko, who died before her - but her performances overwhelmed us with their strength, range, and subtlety.